Microsoft has released a new tool that takes the hassle out of designing apps by turning sketches into useable code. Designing apps usually involves drawing them by hand, then coding them from scatch. Microsoft Ink to Code lets developers skip this step by drawing using a mouse or touchscreen, then turning the sketch into a working prototype. 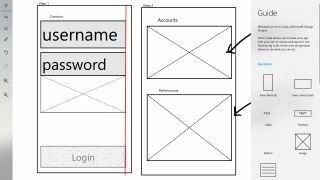 Ink to Code uses AI to automatically tidy up hand-drawn designs, resizing and aligning elements to create a neat wireframe. Ink to Code is only a prototype at the moment, but it's available to download free from the Windows Store. Ink to Code is the latest experimental app to emerge from Microsoft Garage – a space for the company's employees to hack technology and explore new ideas. Other projects currently in the Garage include Holographic Photo Project, which uses HoloLens mixed reality to project 3D models into the world around you; Dictate, a speech-recognition add-on for Microsoft Office that uses the same tech as Cortana; and Color Binoculars, which replaces tricky color combinations with shades that are easier for people with color blindness to differentiate.